"He who knows how to appreciate colour relationships, the influence of one colour on another, their contrasts and dissonances, is promised an infinitely diverse imagery." Exploring colour is something our children have revisited over and over this year. 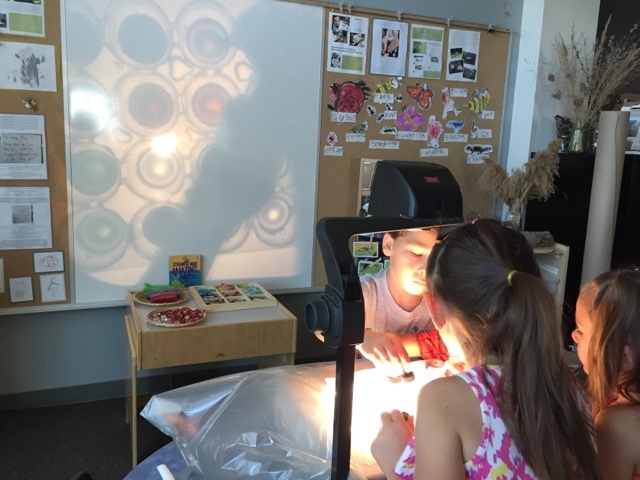 They have spent time wondering about the diverse shades of nature in each changing season, appreciated the nuances of shades in natural and found treasures, and used light and colour to create their own amazing art both in and out of the classroom. 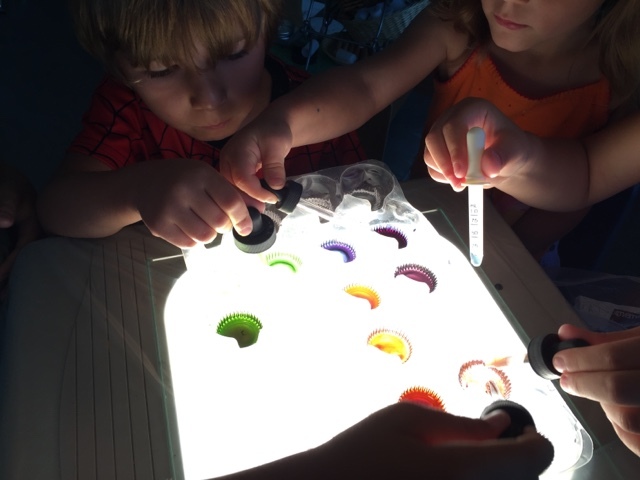 The children were immediately captivated; with the light dimmed in the room their attention focused on the illuminated tray and the interesting projection that was cast on the wall. The water in the tray danced as children brushed up against the table, clambering to get close and have a look. The reflection mirrored on the wall and the interesting way the water looked caught many children's attention. "Why is it moving like that?" "It's jumping; it's happy to see us." "It's happy to have colour in it. The colours are pretty." "I'm going to make more pretty colours. I'm going to mix them together." "We need droppers to do this!" 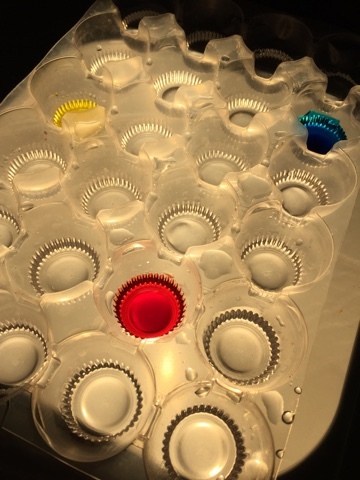 We used a clear tray (donated by a parent who worked in a store that sold kinder eggs) filled with water. One spot had red food colouring, one had yellow and one had blue. The children used the droppers to collect the primary colours and move them from spot to spot on the tray. As they mixed new and interested shades emerged and were illuminated by the light underneath. It was interesting to observe the children collaborate as they created new shades ("You need to add some blue if you want that to be a dark purple." "I like that colour - golden orange - it looks like your shirt.") and listen to their rich art talk. They vividly described the different shades of beautiful colours, named them (e.g., golden orange, sky blue, dandelion yellow), and explained how they created each using math language ("If you want to create golden orange you need to add three drops of red, three drops of yellow to make it equal and then add a drop or two of brown."). The process of what was being created was more important in this experience than a final product. When the tray became filled with colours and most had turned brown from overmixing, it was cleared and fresh water and new primary colours were added. 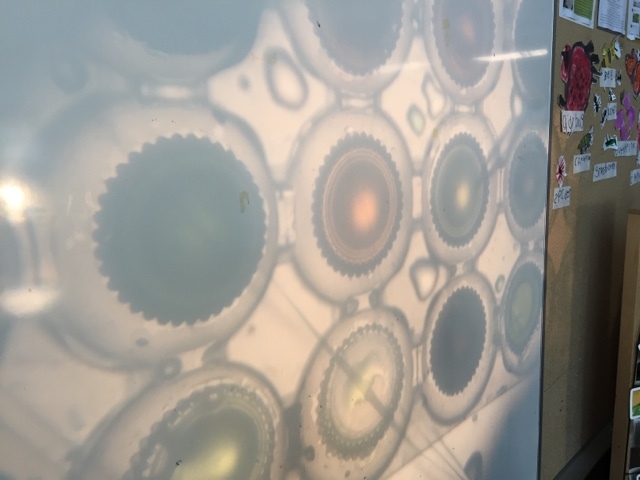 The overhead machine worked as a light source to illuminate the tray from below and also projected the creations on the wall. Because the tray was clear the different shades of colour were projected onto the white board and cast an interesting hue to that corner of our room. 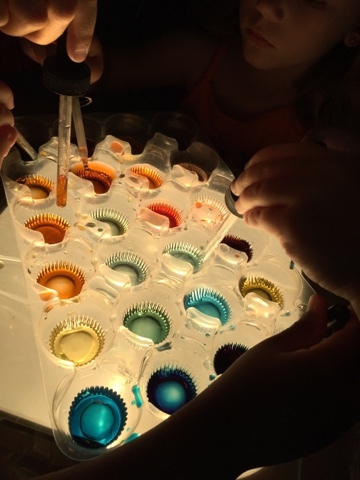 Children who were playing at centres nearby would often stop to watch as new colours were projected - it was interesting to hear their observation as well as they watched the different drops of colour get added to the tray and then the new colour emerged. "Look! She just added blue to that but it's turning green!" "I like that pink one. Pink is my favourite." 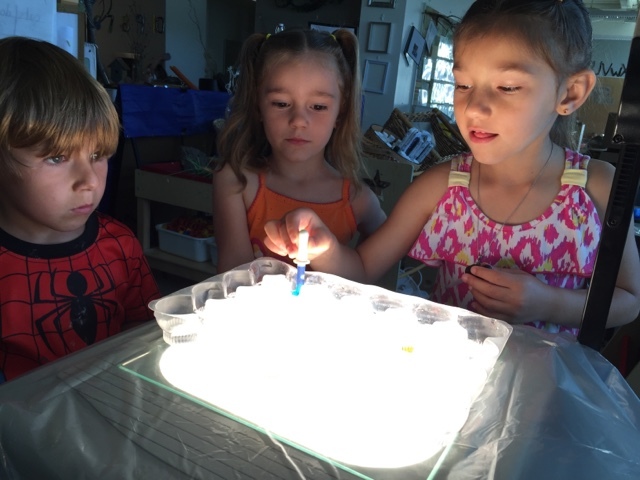 Anytime invitations can be offered to children that integrate unique curriculum expectations in unexpected ways, learning becomes magnified as children use previous experiences to form a base of knowledge both from which to draw and as inspiration for next steps. 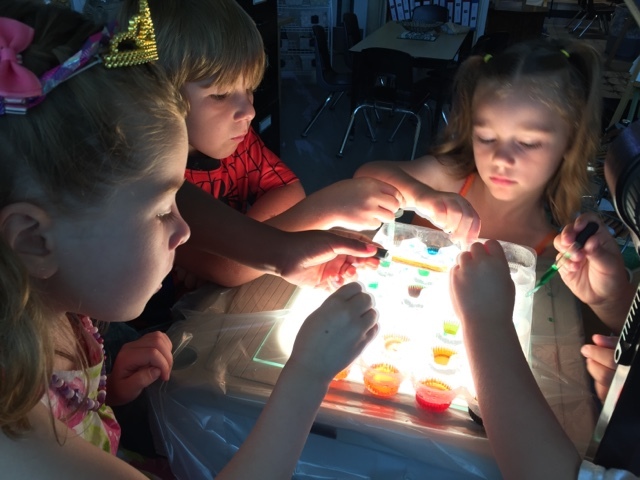 We love combining art, technology and science into captivating provocations that help children create transient artwork. 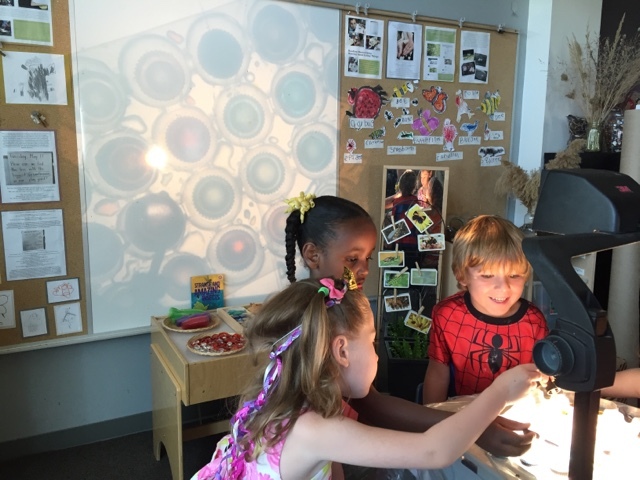 These precious fleeting moments of beauty and wonder shape our space and make learning fun! The overhead machine has proven to be an indispensable piece of technology for our room - leave comments below to tell us how you have used it in your space!